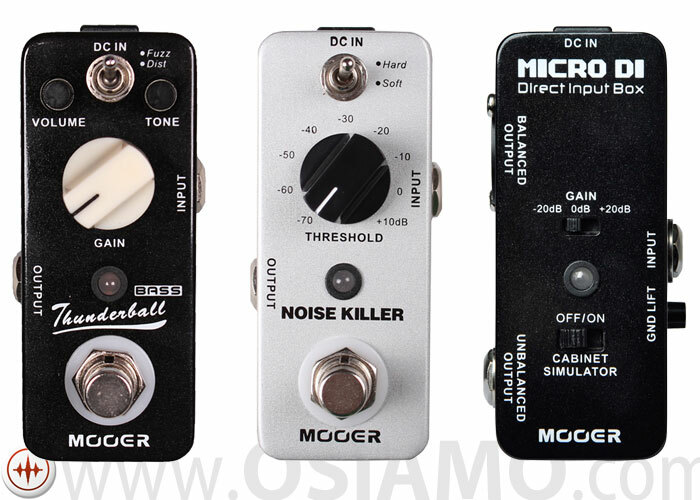 Mooer have release 3 new pedals in the popular micro series: the Thunderball, Micro DI, and Noise Killer. Mooer really did their homework with these pedals as all three not only sound great but are useful and fill out nicely the Mooer micro range. The Thunderball is a bass distortion and fuzz pedal that has a dynamic feel and is great a reproducing the sought after vintage rock tone. The Micro DI is a useful tool that does what it’s name says plus has a cabinet simulator. Finally the Noise Killer is simple and effective in eliminating unwanted noise. Read below our more detailed reviews. Are you looking for the ultimate in bass distortion pedals? Your search is over… Introducing the Mooer Thunderball. The Thunderball covers the spectrum, when it comes to bass Fuzz/Distortion tones. Featuring Volume, gain and tone controls, the Thunderball, easily, lets you find your tone. From classic “tube amp” drive to modern overkill, the Mooer Thunderball will take you there. All this, while maintaining your dynamics and the character of your bass. Guitar and Bass players hate noise; whether it’s from pickups, lights or pedals, it doesn’t matter. The Mooer Noise Killer provides a simple and effective way to eliminate that noise. The Noise Killer features a Threshold control, which sets the point at which the unit starts to “kill” the noise. In addition, the Hard/Soft switch lets you decide how aggressively the Noise Killer treats the offending signal. It’s that easy. If you need a quick and easy way to eliminate noise, the Mooer Noise Killer is your pedal.